A native Kansan, Jean Cook grew up on the family farm helping with harvests and caring for the family cows, sheep and horses. Her artwork is inspired by her real-life experiences showing horses, working cattle drives and traveling to unusual locations around the world. 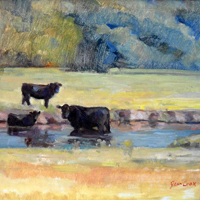 Her paintings reflect an emphasis on the use of color, light and shadow to create dimension and depth, developed through her studies at Hutchinson Community College, the Kansas City Art Institute, private studios and her work as an engraving artist at Hallmark Cards.